My time with that big ape continues with my exploration of King Kong titles thanks to the Sci-Fi Chronicles book. 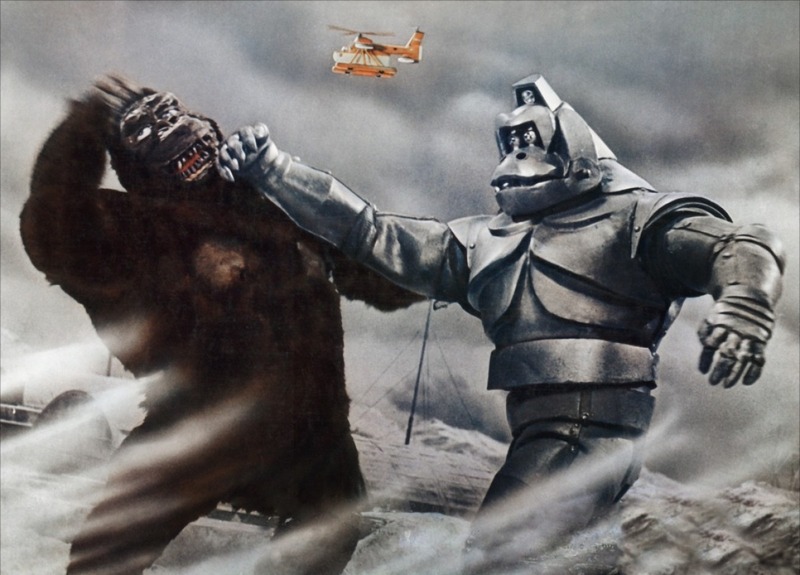 The fun, goofiness of King Kong Vs. Godzilla would be hard to top, and this film can’t quite seem to do it, though it does introduce the pretty cool, and drastically underused Mechani-Kong!! The film opens with a UN sub, captained by Carl Nelson (Rhodes Reason), with Lt. Cmdr Jiro Nomura (Akira Takarada) and the lovely Lt. Susan Watson (Linda Miller) at his side, looking for oil (funny considering the next film) and talking about a remote island, known as Mondo, and rumoured to house a monster known as Kong (a man in a suit, as before, with the most vacuous and ridiculous looking facial mask). When the sub is forced to stop at the island they were just talking about, our heroic trio leave the sub in a quaint little hover jet, and set out to investigate. Kong is quickly discovered and has a knock-down fight with a Tyrannosaur (?) – and I never knew those buggers had such vicious kicks! Susan becomes the apple of Kong’s eye, but she leaves him behind when the UN crew return to their sub. They have to report this! While the UN forces are trying to find a peaceful resolution to the rampaging ape, Tokyo may not be able to handle it, and things get even worse when Who releases Mechani-Kong to face off against the big ape. There are laughs, lots of enjoyable model work, towns getting trounced, and really bad men-in-monster-outfits fighting (though I will admit, Mechani-Kong does look kinda cool). This film, much like the previous one, are wonderful Saturday afternoon fun, grab some popcorn, put your feet up, and just settle in for pure enjoyment. These films know they aren’t changing the world, they’re here to bust up villages and cities and let us have fun watching it!